The Christian Hackenberg era is over with the New York Jets. It ends with zero regular season passes thrown, multiple reporters hit with errant passes at preseason practices, and one low-yield trade with the Raiders. On Tuesday, the Jets traded the Hackenberg, who was a second-round pick in 2016, to Oakland in exchange for a conditional seventh-round choice in 2019. Bowles: QB Christian Hackenberg has been traded to Oakland for a 2019 conditional 7th-round pick. 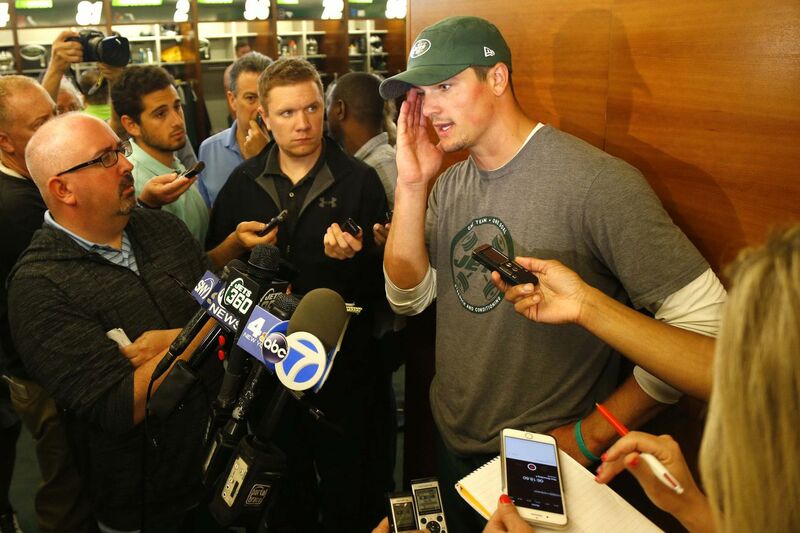 Hackenberg spent two seasons in New York but couldn’t beat out Josh McCown, Bryce Petty, Ryan Fitzpatrick, or Geno Smith to hear his number called for Todd Bowles’ roulette wheel of bad quarterbacks. He ends his Jets tenure with fewer passes thrown than punter Lac Edwards. That carved out an ignominious place in history for the young signal caller. The Jets did not share that outlook. Hackenberg was clearly the odd man out in a four-man quarterback rotation that includes McCown, former Pro Bowler Teddy Bridgewater, and 2018 No. 3 overall draft pick Sam Darnold. He failed to take the field for even a single snap at Tuesday’s official team activities. Now he’ll join an Oakland depth chart that won’t afford him many new opportunities to see the field. 2016 MVP candidate Derek Carr is firmly entrenched as the team’s starter, and E.J. Manuel and Connor Cook fill out the roster behind him. Once again, Hackenberg will be the fourth option for a team that could keep only two quarterbacks. It’s another unexpected roster-shaping move for once and current head coach Jon Gruden. The former Monday Night Football analyst has taken several steps to reshape the Raiders since his hiring in January. Since then, he’s released contributors like Michael Crabtree, David Amerson, and Marquette King while adding a whopping 18 free agents from other teams and nine draft picks. Gruden has gone on record to express his love for Hackenberg in the past, so maybe it’s no surprise he leapt at the chance to acquire him for peanuts. The biggest surprise to me on Hackenberg is that no one is really talking about him in the first round. This was the No. 1 prospect in the nation a few years ago and someone who showed during his freshman year he could produce at a high level in a true NFL-style offense. What he showed during that first year at Penn State — before the coaching change, before the system change, before all the things that derailed him — would be enough for me to take this guy early. The trade quite a downturn for a player who once garnered top overall pick hype during his time at Penn State. The big-armed pocket passer put the Big Ten on notice with an electric freshman season, then failed to follow-up on that performance in his final two years with the Nittany Lions. His 2013 potential was enough to entice the Jets to spend their second-round pick on him in 2016. Now, two years later, they might be able to turn that investment into a seventh-rounder, should Hackenberg meet the conditions of his trade.